Gaza’s only power station will close by the end of this week following a European Union decision to stop buying fuel for the plant. According to the power station’s director, Rafeeq Maliha, “Since last November the EU has stopped funding the purchase of diesel for us.” This means, he added, that without some external intervention between now and this weekend, the densely populated Gaza Strip will have no central power source to operate many basic services. Engineer Imad Canaan, the vice president of the Palestinian Power Authority explained that the power authority is unable to continue providing adequate energy resources to the citizens of Gaza. “The Israeli blockade and the suspension of EU support have reduced the output of the station by 50%,” he said. Palestinians in Gaza have a lot to contend with, especially since the war launched by the Israeli Occupiers just over a year ago. With the loss of more than 1,400 Palestinian lives, most of whom were women and children, the near total destruction of whatever little infrastructure that remained and the general pillaging of the territory, Palestinians are once again faced with the prospect of rebuilding their lives in the besieged Gaza Strip. However, because of the ongoing Israeli blockade on essential materials, the Palestinians have not been able to carry out any reconstruction of their houses, hospitals, schools and the local infrastructure, including the power station and sewage treatment plants. Sewage disposal has become a huge problem all over Gaza, with leaks onto farmland and into nearby water sources leading to pollution and less fertile soil, which in turn has led to poor harvests. Sewage and waste material from cities and refugee camps with limited access to sewage treatment plants is ending up in water sources which lead to the beaches of Gaza and the sea. This has resulted in severe water pollution and the contamination of fish, as well as a variety of acute and chronic water-borne diseases. Israeli prison staff impose financial punishments on Palestinian prisoners. A human rights organisation has claimed that Israeli prison staff are imposing financial punishments on Palestinian prisoners. In a statement, the Prisoners’ Centre for Studies said that guards and administrators in Israeli prisons force Palestinian detainees to pay for the water and electricity that they consume as a form of additional punishment. According to the centre, prisoners are also “fined” for trivial reasons, such as reading the Qur’an or praying during the prison’s daily roll call (if officers enter when it is the time for prayer); if the imam, while giving the Friday sermon, utters a word that the guards don’t like; when a prisoner doesn’t manage to get out of the bathroom in the time specified by the guards; and for other similar reasons when the guards abuse their positions and use any excuse to penalise prisoners. The centre’s director, Raafat Hamdouna, claims that prison administrators withdraw the “fines” from prisoners’ personal bank accounts without informing prisoners. If anyone doesn’t have a bank account, the administration imposes a future fine against his name, provoking the prisoner even further. Fifty-four members of Congress urging the president to pressure Israel to treat Gazans like human beings is a positive development, albeit a VERY small one. Critics may content that the letter protects Israel’s image. I understand that. But I still think it’s encouraging. Names of the 54 are at the above link. Just so we know who actually cares about the people of Gaza. Considering 344 voted to condemn the Goldstone report I do not see this going to far. Even the UN has tried to get the blockade removed. Gaza is in desperate need of materials to repair rebuild. Soon they will have no hydro. So just imagine if you had no hydro. This will affect evrything from hospitals to bussiniesses and storage of food and the list goes on an on. Aid money was promised to help rebuild Gaza and little to none has been received by them. The blockade keeps everything out. This is also in the face of a recent flood in Gaza which has done even more damage. This of course was never in the main stream media. How typical. Of course much of what we should be told is never in the main stream media. Shame on them. Shame on the world leaders who do nothing but talk about it. That is all they do is talk. Of course that makes it into the media and fools the public at large that they are actually doing something, when in fact they are really doing nothing. What has changed for those in Gaza or the West bank in the last year. NOTHING. ABSOLUTELY NOTHING HAS CHANGED. Their lives go from bad to worse is all. Every day their lives are more difficult. Thanks to the world leaders who pretend to do something. That is all they do is pretend. They are doing little to help ease the pain and suffering of the Palestinians. Seems the EU and Western Countries have done little to nothing to help those in Gaza. Due to the lack of real help people are suffering beyond imagination. Ignored by the Main stream media and World Leaders. Tiger Woods got more air time then people who are suffering and dieing. Well that says it all doesn’t it. How coincidental the Gaza flood took place during the Haiti Crisis. Guaranteed it would be ignored by all the main stream media. Gaza is in crisis and no one seems to notice. The 54 who signed the letter to Obama at least care enough to try. Will Obama listen I hardly thing so he is helping Egypt built the wall of shame and it is a shame. He has done nothing to ease the desperation of those in Gaza and if any time he says he is doing something I know as many other do it is pure BS. His actions and those of the US Government speaks volumes. They want to destroy the people of Gaza. One year after Israel’s military offensive on Gaza, United Nations agencies and the Association for International Development Agencies (AIDA), representing over 80 NGOs, are highlighting the impact of the blockade on Gaza on the health of its population and on health services – and are calling for an immediate opening of Gaza’s crossings. The economy of Gaza is in virtual collapse with rising unemployment and poverty which will have long term adverse effects on the physical and mental health of the population. The environment is also in decline, including water quality, sewage and waste disposal and other environmental hazards (including munitions and medical waste) which may lead to long term effects on health. More than 750,000 children live in Gaza. The humanitarian community is gravely concerned about the future of this generation whose health needs are not being met. The decline in infant mortality, which has fallen steadily over recent decades, has stalled in the last few years. The lack of building materials as a result of the blockade is affecting essential health facilities: the new surgical wing in Gaza’s main Shifa hospital has remained unfinished since 2006. Hospitals and primary care facilities, damaged during operation ‘Cast Lead’, have not been rebuilt because construction materials are not allowed into Gaza. Operation ‘Cast Lead’ damaged 15 of Gaza’s 27 hospitals and 43 of its 110 primary health care facilities were either damaged or destroyed. Supplies of drugs and disposables have generally been allowed into Gaza – though there are often shortages on the ground. However, certain types of medical equipment, such as x-ray equipment and electronic devices are very difficult to bring in. Clinical staff frequently lack the medical equipment they need. Medical devices are often broken, missing spare parts, or out of date. Health professionals in Gaza have been cut off from the outside world. Since 2000, very few doctors, nurses or technicians have been able to leave the Strip for training necessary to update their clinical skills or to learn about new medical technology. This is severely undermining their ability to provide quality health care. Many specialised treatments, for example, complex heart surgery and treatment for certain types of cancer, are not available and patients are therefore referred for treatment to hospitals outside Gaza. But many patients have had their applications for exit permits denied or delayed by the Israeli Authorities and have missed their appointments. Some have died while waiting for referral. More than 61 years since the Palestinian Nakba (catastrophe) and 42 years after Israel’s belligerent occupation of the West Bank and Gaza Strip, the issue of forced displacement of Palestinians from their homeland remains an ongoing phenomenon that fails to receive the attention it deserves. At the end of 2008, at least 7.1 million Palestinians, representing 67 percent of the entire Palestinian population (10.6 million) worldwide were displaced persons. Among them are 6.6 million refugees and 427,000 IDPs. This makes Palestinian refugees and internally displaced persons (IDPs) the largest and longest-standing case of displaced persons in the world today. Palestinians seized during Israel’s operation in Gaza faced “appalling” conditions and “inhuman” treatment, Israeli human rights groups have said. The seven groups say they have gathered 20 testimonies which indicate detainees were kept in pits without shelter, toilets or adequate food and water. Some detainees also said they had been held “near tanks” and in combat areas, the groups said. 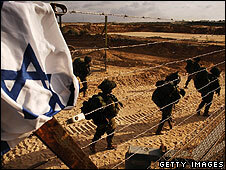 The Israeli military says it is investigating the allegations. The accounts were gathered by the Public Committee Against Torture in Israel (PCATI) and Hamoked, the Center for the Defense of the Individual, from Palestinians now being held in Israel. “The reports indicate that… many detainees – minors as well as adults – were held for many hours – sometimes for days – in pits dug in the ground, exposed to bitter cold and harsh weather, handcuffed and blindfolded,” the groups said in a statement. “These pits lacked basic sanitary facilities… while food and shelter, when provided, were limited, and the detainees went hungry,” it said. The groups accused the military of “gross violation of international humanitarian law” by holding some of the detainees close to tanks. Incidents involving “extreme violence and humiliation by soldiers and interrogators” were also reported, the statement said, without giving details. “We were handcuffed and blindfolded. They put us in a three-meter deep ditch with some 70 other people,” Majdi Muhammad Ayid al-Atar, 43, from northern Gaza described, in one of the testimonies. “We spent two days there without any food, water or blankets. They also didn’t let us go to the toilet. Afterwards they moved us to another ditch. The soldiers kept beating anyone who dared ask for anything,” he was quoted as saying. The groups have addressed a written complaint to the Military Judge Advocate General, and Israel’s Attorney General, Meni Mazuz. Attorney Bana Shoughry-Badarne, Legal Director of PCATI, said the findings were “particularly objectionable” as the Israeli military had repeatedly stressed that it “prepared at length for the Gaza operation”. “It seems that, during these lengthy preparations, the basic rights of the detainees and captives were completely forgotten,” she said. She said the groups had the names of 29 people who had been detained, 25 of whom were still being held. The other groups were the Association for Civil Rights in Israel, Physicians for Human Rights, B’Tselem, Yesh Din and Adalah. They were using the detainees as “Human Shields”. This of course is what they said Hamas was doing, but of course Israel itself was doing it. Seems Israel does everything, it says Hamas is doing. One has to wonder how many detainees they have in their prisons? Considering many people have been kidnapped from Gaza in the past, the number may be very high. One can bet they are being tortured as well. I wonder how many “Guantanamo prisons” there are in Israel?